Anyone who follows these Notes from Home and Away is all too aware that the sport of ice hockey has emerged as a sub-plot in our ever-evolving story. 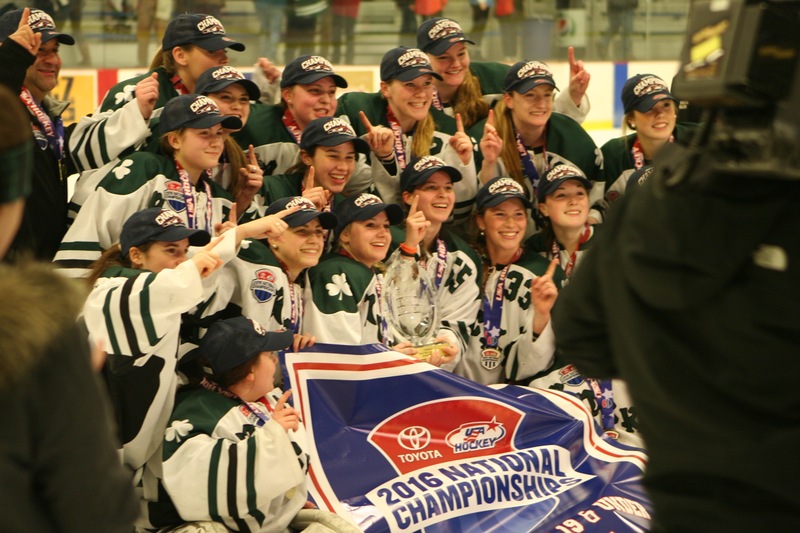 Our followers may also remember that for the past two years Ellie’s Vermont Shamrocks U-16 team won the New England Regionals and earned the privilege of representing New England in the Tier II USA Hockey National Championships. In 2014 we made it into the semifinals in New York. 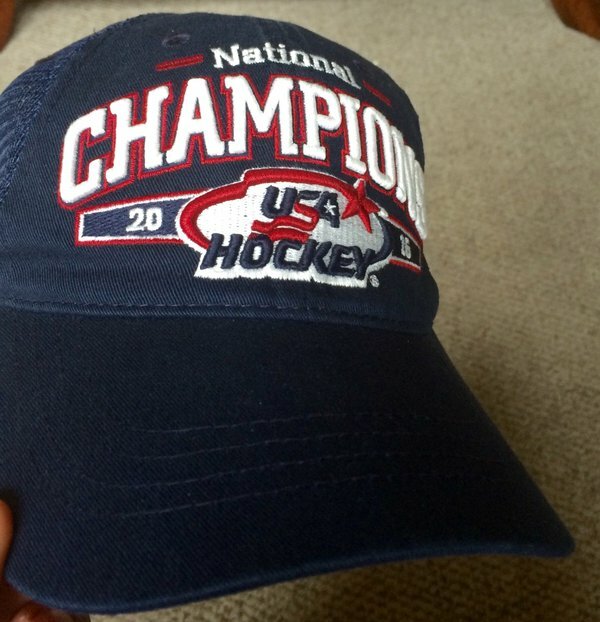 And in 2015, in Lansing, Michigan, we lost a thrilling double-overtime game to Alaska to take the bronze medal. 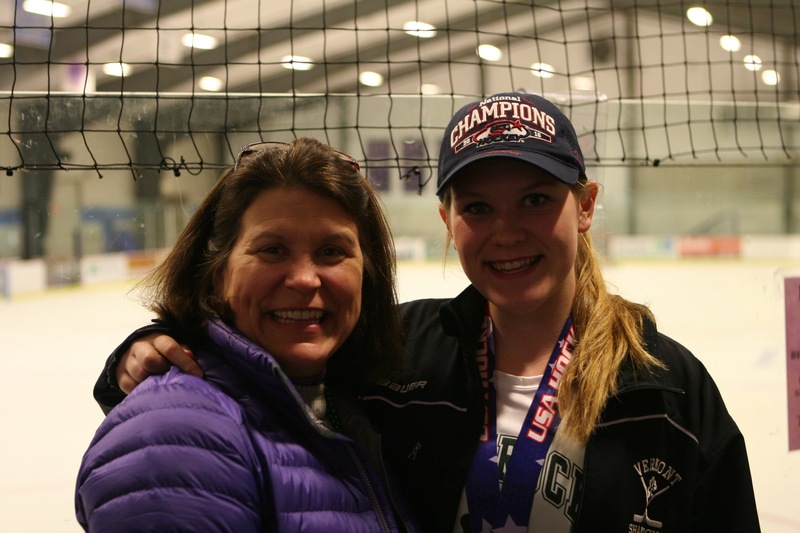 The site for 2016 national tournament, happily for us, was in Burlington, Vermont— our hockey home away from home over the past eight years or so—ever since Ellie joined a U-10 Shamrocks team. 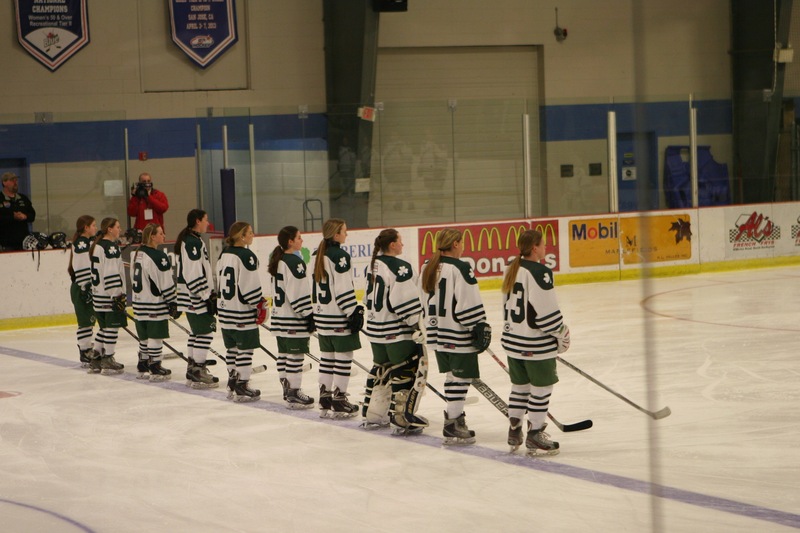 Hers was one of the first few teams in the all-girls Vermont Shamrocks organization that has grown steadily since. 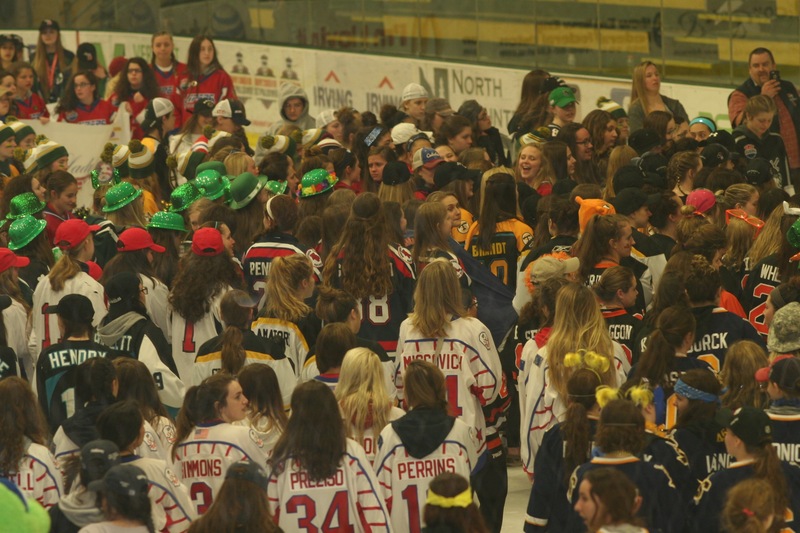 Thirty-six teams from around the United States gathered for the Tier II tournament this year and the opening ceremony in the Gutterson Rink at the University of Vermont was girl power at its best. 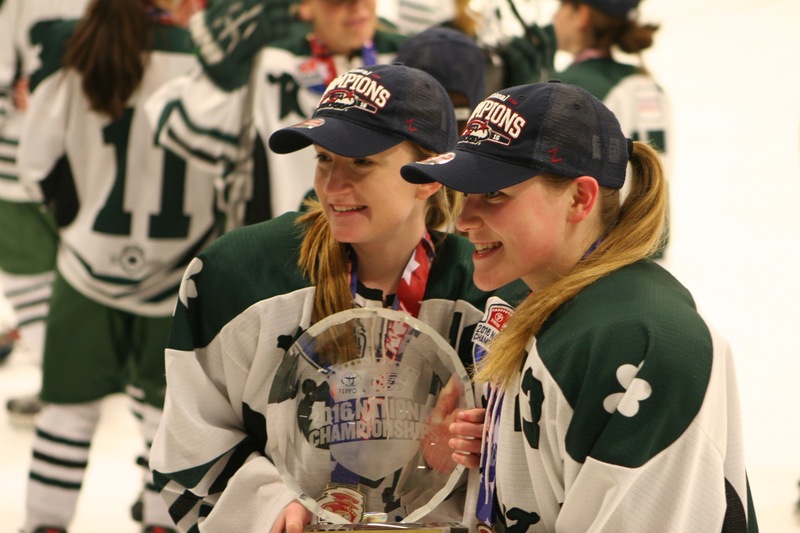 In the U-19 division, the Shamrocks were up against the teams that had come out on top in their regional qualifying tournaments: New York, New Jersey, Connecticut, Alaska, Utah, Florida, South Dakota, Massachusetts, Michigan, Pennsylvania, and Illinois. We received a host bye and were not allowed to play in the regionals. So we accepted an invitation to a tournament in Stanstead, Quebec, so that the girls who play on different high school teams all winter could get used to playing with one another again. And so the 2016 tournament began. Thursday was the first day of pool play—ours a somewhat sluggish game against New Jersey that we won 1-0. On Friday we faced off against Utah (the “Lady Grizzlies”) and came out on top 3-2. On Saturday we played three periods and an overtime to a 3-3 tie against New York that we then lost in a deciding shootout. No worries for us, though, as we came out of pool play with seven points—ranked third behind Massachusetts and Connecticut, teams that had allowed their respective opponents a total of only two goals in five games. Each team had also scored seventeen goals in that five-game stretch. The Shamrocks, not a high-scoring team, had scored seven goals and allowed six in their first five games. In the single elimination games that began on Sunday we came out on top (2-0) against a group of big, strong girls from South Dakota. Then, in the evening matchup, we came out flying against the fast skating Massachusetts Spitfires. The Shamrocks were finding their legs and played a convincing and confidence-building game, pulling away from the top-seeded team for a 4-1 victory and a spot in the final on Monday. Monday’s final was a tight game. Overall, in the end, we tallied thirty-five shots on goal to their nineteen. But the game was close, and close games, as hockey aficionados will tell you, can go either way. We scored first in the opening period. Then they tied the game in the second period. The third period ended in a draw with the score tied 1-1. And so we went to a seventeen-minute overtime. But five minutes in—after a number of attempts and opportunities—Ellinore charged toward the puck below the blue line and threw the puck at the net. It hit the goalie’s pad. The rebound glanced out to the right. Riley was standing there. She didn’t miss. Game. National champs! Ellinore had a fantastic tournament—skating aggressively, as her brother insisted in a pre-tournament note from Bolivia she should, and with confidence—scoring a goal against New Jersey and tallying three assists over the six games of the tournament. What is notable about this Rocks team is that in two national championship runs (2015 and 2016) they did not lose a single game in regulation: their overall record is 8-0-3, with two overtime losses in the 2015 tournament and one overtime loss and one overtime win (the one that counts!) in 2016. BURLINGTON, Vermont. 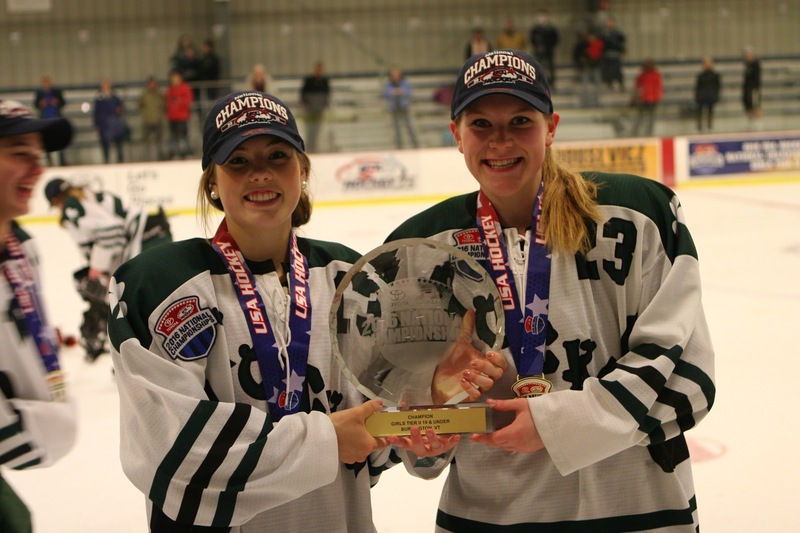 — The Vermont Shamrocks Girls U-19 Ice Hockey team won the Tier II USA Hockey National Championships on Monday in overtime vs. the Connecticut Northern Lights. 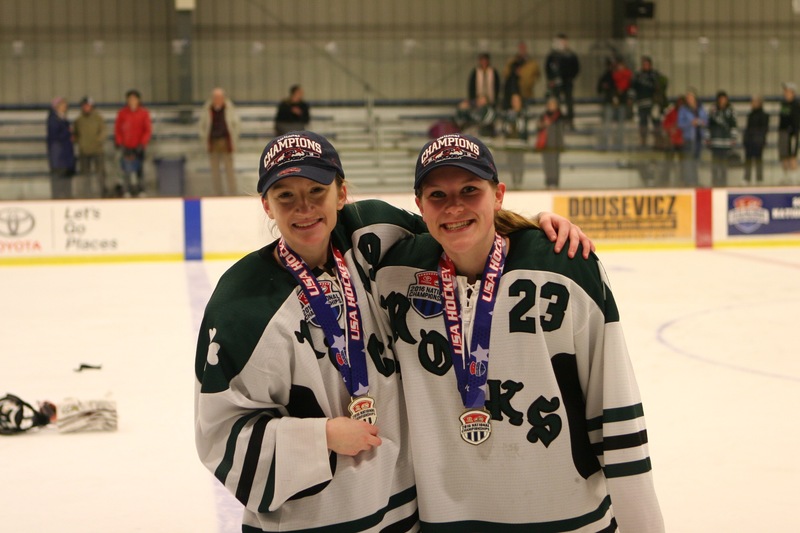 Local players Ellinore Todd Long (West Chesterfield) and Alyssa Roof (Spofford) helped anchor the defense for the Shamrocks in a win over Utah and a shootout loss to New York in pool play. Todd Long scored a goal and had three assists and Roof had an assist in wins over Utah, South Dakota, Massachusetts, and Connecticut in their run to the championship. Todd Long is a junior and Roof is a senior at Northfield Mount Hermon School.